Dribbling is how you move the ball while maintaining possession. It's important to keep your hands apart (as in the Ready Position) and not let the ball get too far away from you. 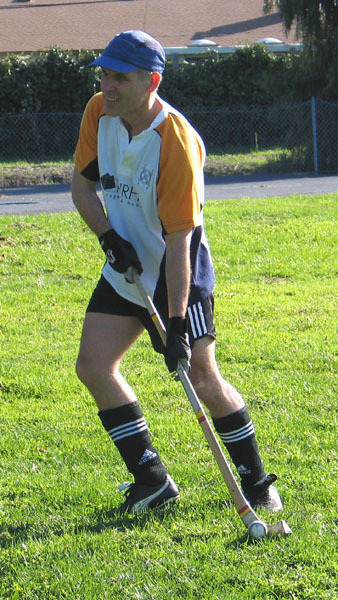 Use both sides of the caman head to control the ball (note this difference between shinty and field hockey rules). It's important to keep an eye on the field and players while dribbling, don¹t get too caught up in looking at the ball! 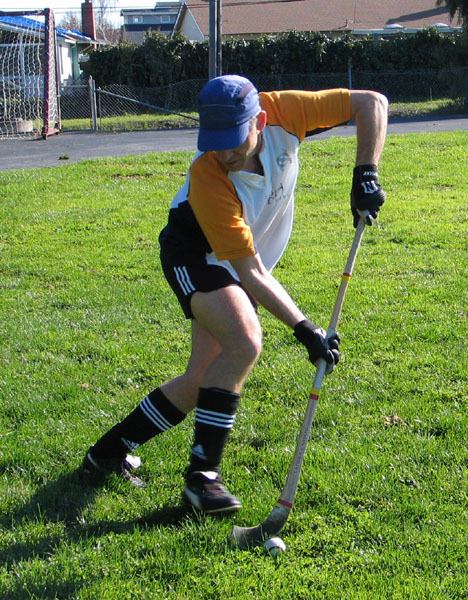 As you get used to handling the caman there are situations in which one-handed dribbling might be appropriate, but be sure to maintain control of the caman at all times! NOTE: Above you can see dribbling demonstrated with two variations of grip, showing right and left hand, respectively, as top hand. In the normal run of play it is better to keep your hands in the same orientation (right OR left as top hand), and slide the lower hand up and down the caman as play requires for different hitting and ball handling.